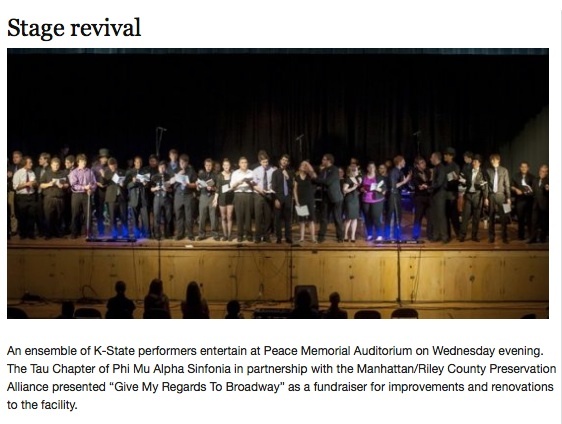 ﻿﻿The Friends of Peace Memorial Auditorium is an organization that has formed with the goal of working with the City of Manhattan to help raise funds to renovate Peace Memorial Auditorium. The Friends of Peace Memorial Auditorium has established an account with the Greater Manhattan Community Foundation to accept tax deductible donations. 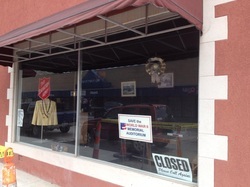 Donations may also be sent to the Friends of Peace Memorial Auditorium. 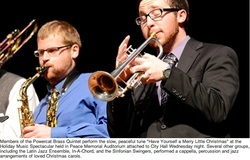 To make an online donation, visit the Greater Manhattan Community Foundation's web site. 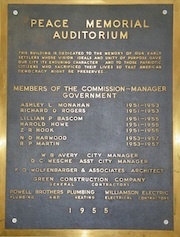 The Friends of Peace Memorial Auditorium Fund is included in the category "Preservation, Conservation & Beautification." 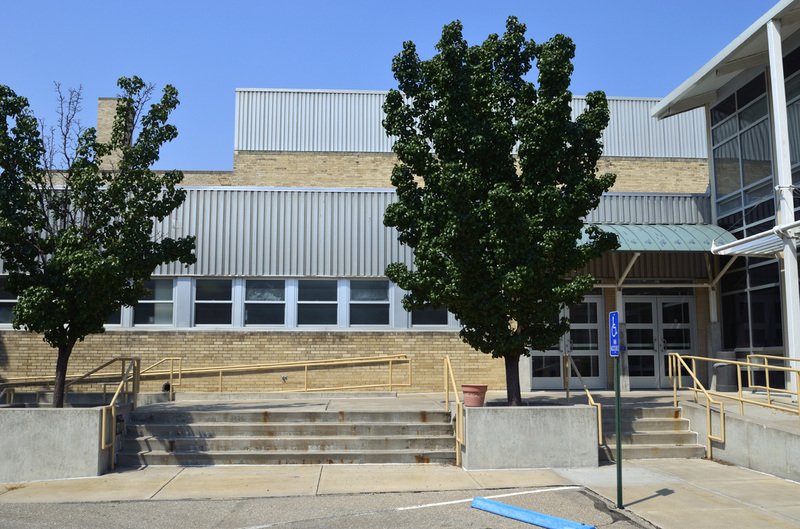 The City Commission gave consensus approval for city staff to work with the project architect and the Friends of Peace Memorial Auditorium to develop costs, scope of work, and a timeline for renovations. 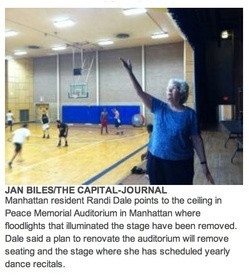 See news article below. On July 1st, the City Commission approved amending the contract with the architect to include design services for a new HVAC system and electrical systems for the auditorium, as well as design services to develop a memorial foyer. 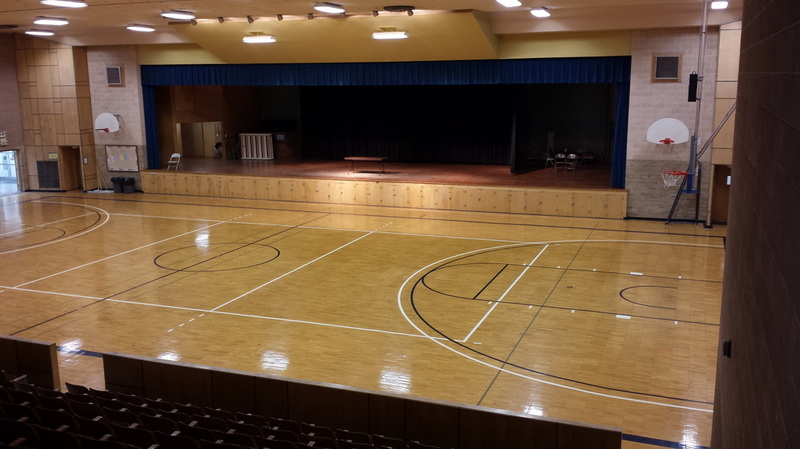 On June 3, 2014, the City Commission discussed Parks and Recreation office expansion and phased renovations to Peace Memorial Auditorium. 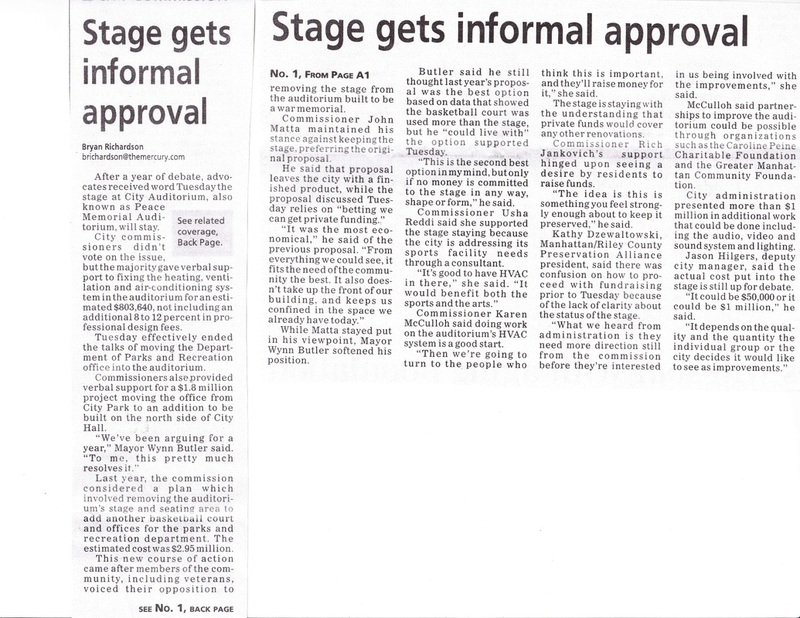 A special joint meeting of the City Commission and the Parks and Recreation Advisory Board was held April 8, 2014. 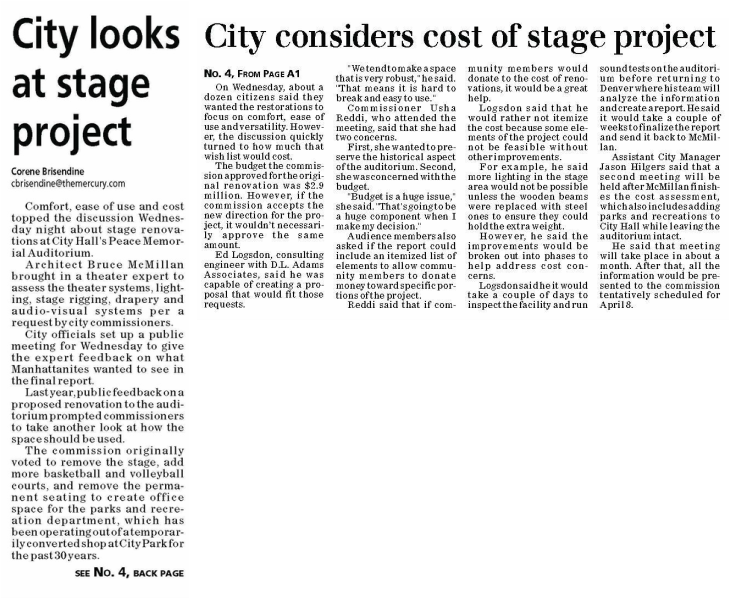 Information from a theater consultant's report and the possibility of adding onto the northeast section of City Hall for Parks and Recreation Dept. 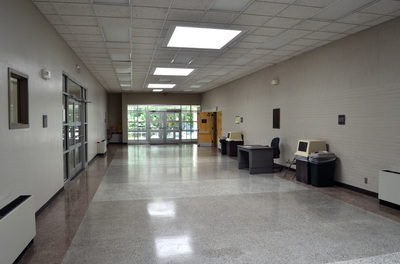 offices was presented for discussion. Since it was a work session, no formal action was taken. In 2013, Manhattan's City Commission discussed plans to dismantle the city's World War II memorial. As the result of advocacy efforts, the memorial is no longer in danger of being converted to offices and basketball courts. 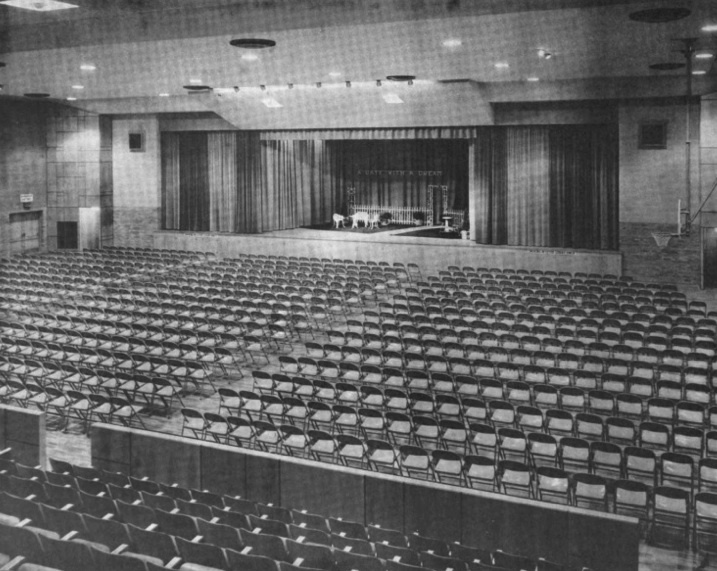 The M/RCPA has uploaded several documents about Peace Memorial Auditorium to provide more information about the memorial and the renovation plans. Some of the documents are large and will open slowly. This document provides information about the history and planning of Peace Memorial Auditorium by using historical documents. 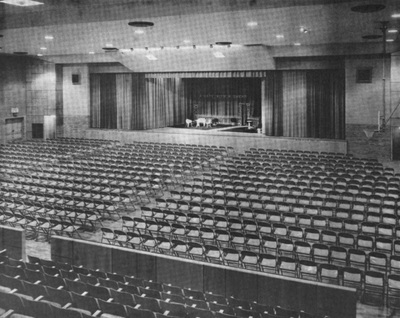 It helps to explain the mindset and motivations of Manhattan residents at the time the auditorium was planned. 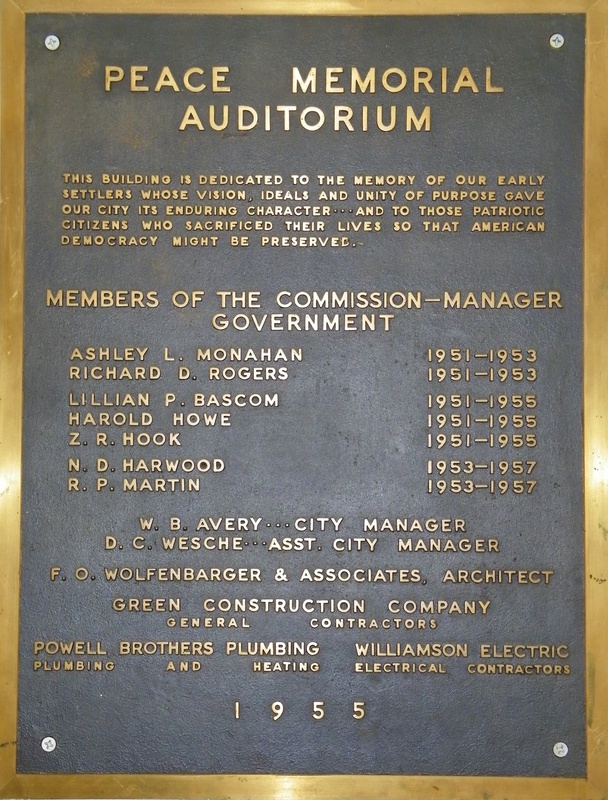 Click the plaque image to view larger. Please be patient -- this is a large file and will open slowly. 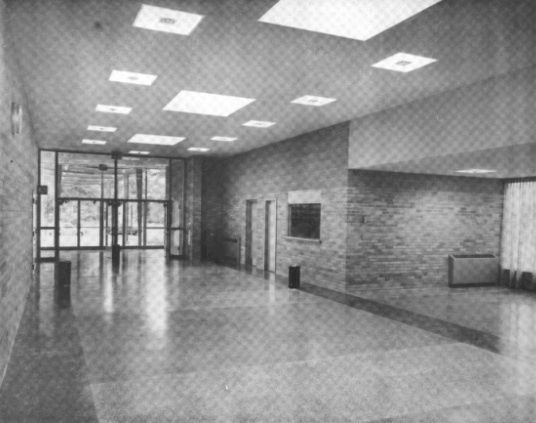 If you'd like to read more about the planning and development of the Peace Memorial Auditorium, read the document prepared by the city in 1955 that was intended to be a "careful recording of the efforts." 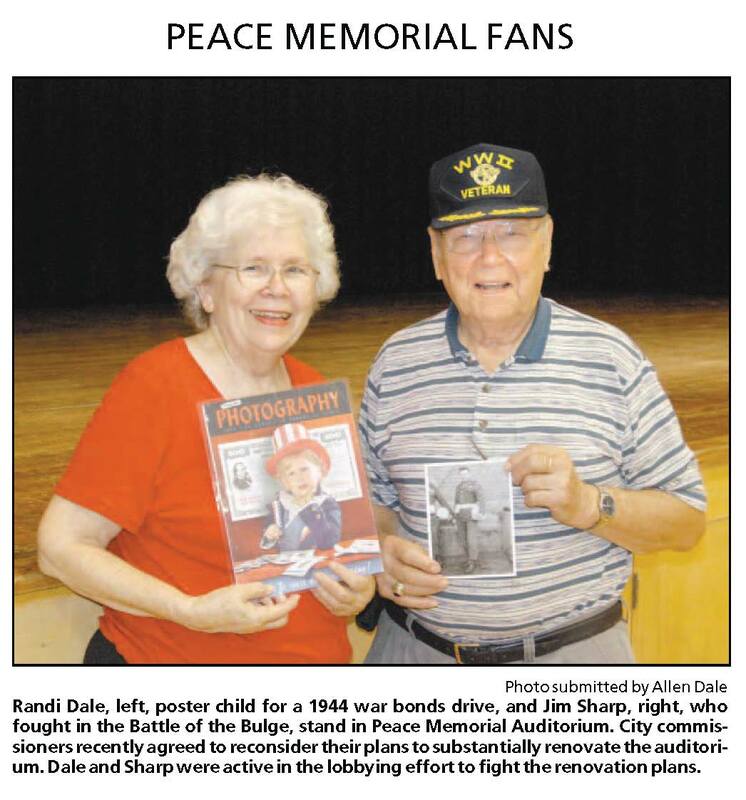 From the document, "The World War had recently ended, and the public was memorial conscious . . . "
Peace Memorial Auditorium is a "living memorial." 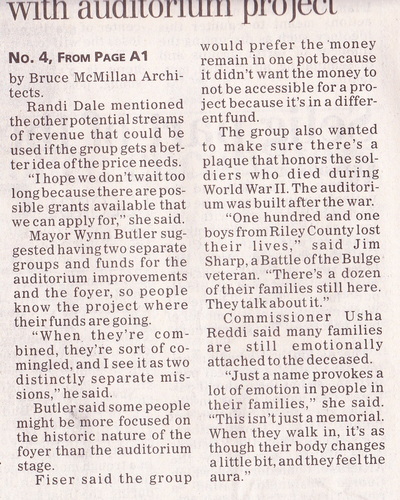 The 1945 article explains the philosophy of "living memorials" and the desire to create useful memorials. 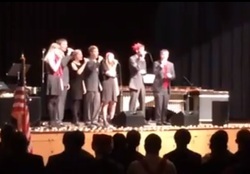 "Gold Star" refers to a service member who was killed in combat operations. "The 101 who did not come back, whose bodies lie in rest over the world, are still with us spiritually. Granite shafts or temples of memory have their place, but these 101, we believe, would want something more than that . 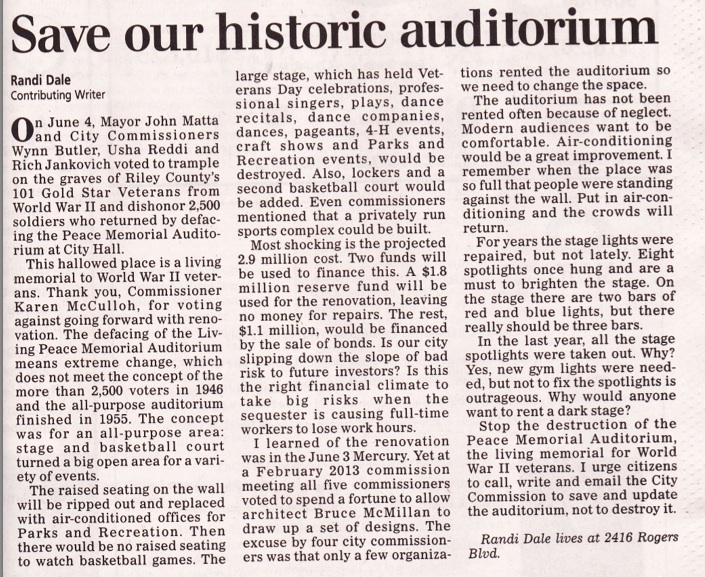 . . " Click the button to read the full editorial that encouraged voters to support the ballot initiative to construct a memorial auditorium. Signs are popping up around Manhattan! 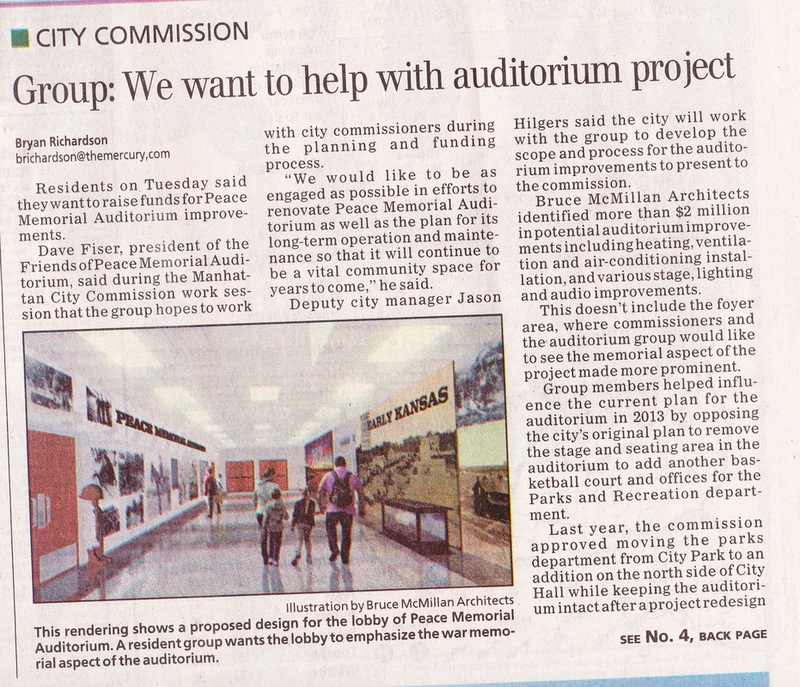 The plans surrounding Peace Memorial Auditorium were discussed Sept. 3, 2013, at City Commission. The motion to continue with the architect and to complete final design plans as previously approved FAILED, with a 2-3 vote. Motion to direct the architect to study alternative options CARRIED by a 3-2 vote. There will be more discussions and numbers to crunch and the future still uncertain, but this was an important vote that will at least open up discussions. 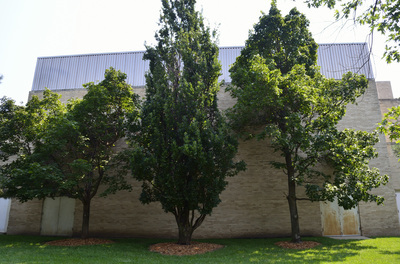 The Manhattan City Commission likely will decide at its Sept. 3 meeting whether it will move forward on a $2.9 million project to renovate Peace Memorial Auditorium or follow the suggestion of the city’s Historic Resources Board to explore alternatives to the project, deputy city manager Jason Hilgers said . 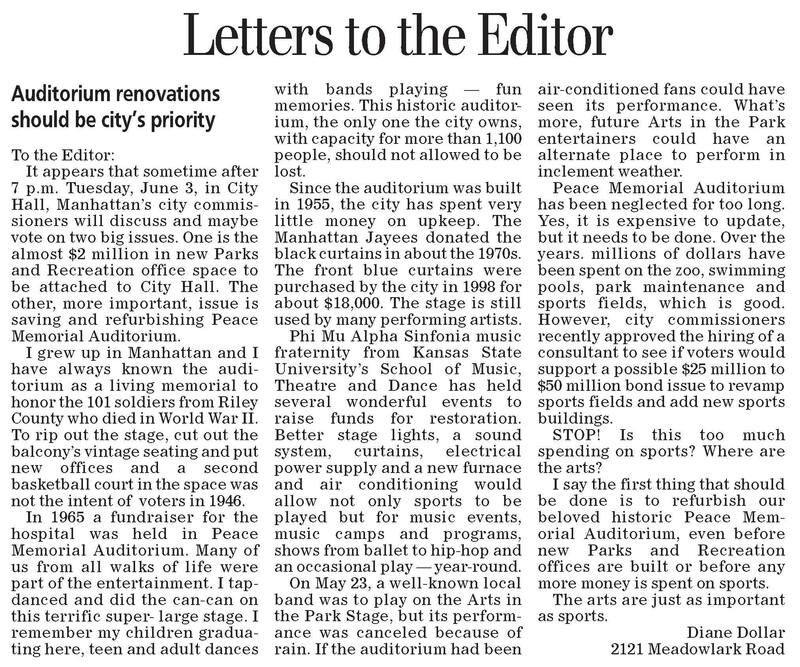 . .
A Topeka-based World War II veterans group has sent a letter to Manhattan officials expressing its concern with a $2.9 million project to renovate Peace Memorial Auditorium, built in the mid-1950s as a living memorial to the 2,610 Riley County veterans who served and the 101 Riley County soldiers who died in WWII. 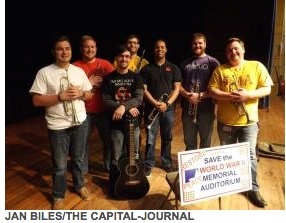 . .
Opinion: Enjoy concert & support Peace Mem. Aud. 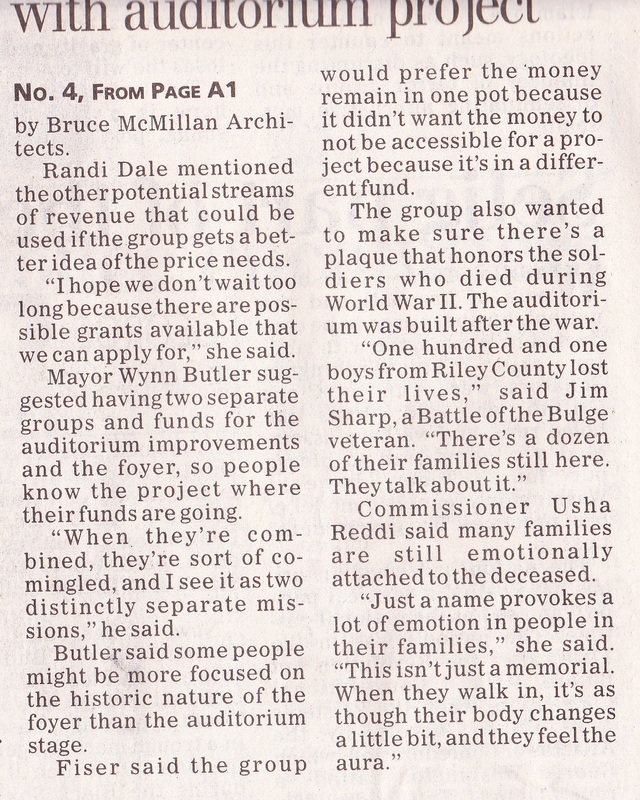 Opinion: Can we restore memorial to use as intended? Sept. 3, 2013 agenda info.